Cardinal Vincent Nichols and Archbishop Eamon Martin, Presidents of the Bishops’ Conferences of England & Wales, and Ireland, have called for solidarity with, and prayer for the Christian communities who live in the Holy Land. The Cardinal and Archbishop were returning from the Plenary Assembly of the Council of European Episcopal Conferences (CCEE) which had been meeting in Galilee and Jerusalem at the invitation of His Beatitude Fouad Twal, Latin Patriarch of Jerusalem. The European bishops visited the Christian communities in Nazareth, Mil'ya (a town near the Israeli-Lebanese border) and Bethlehem, to hear first-hand the experiences, joys and sufferings of Christian families living there. They also met with Palestinian President Mahmoud Abbas and Israeli President Dr Reuven Rivlin. 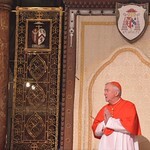 Cardinal Nichols and Archbishop Martin said they were deeply moved by their encounters with Christians in both Israel and Palestine and they both undertook to bring back to their faithful in England, Wales and Ireland the heartfelt wishes of Christians in the Holy Land to live in peace with a sustained hope for safety and a realistic long-term future for their families and children.